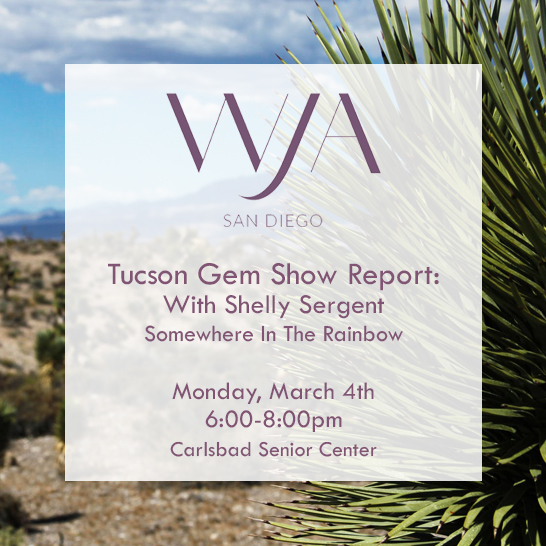 For those of you who couldn't make it to the Tucson Gem Show, we've invited Shelly Sergent from Somewhere In The Rainbow to share insight on the gems everyone is talking about and drooling over. She is happy to dish the dirt on gem trends and maybe even name drop a few jewelry insiders' thoughts on Tucson Gem Show Time! Shelly will also be sharing a look back in Hollywood history as she shares stories of gems and jewels of the stars. Shelly Sergent has spent more than 30 years in the jewelry industry. Starting at age 16 as a holiday season gift wrap girl for Zales Jewelers, Shelly quickly realized her passion for fine gems, design and first class client services. She learned the business of the jewelry industry climbing the ranks from gift wrap gal to sales, service, philanthropy and eventually management. She came to understand the study of fine gems, jewelry making and learning to recognize the finishing details that separate handcrafted, designer pieces of jewelry from a stream line manufactured piece…both of which are important to jewelry lovers the world over. Shelly worked hard to establish herself as an industry ‘go to girl’ for fine, rare colored gems and design. She has had the privilege of working with some of today's top design houses and is grateful for the mentoring, time and shared passion she’s learned from brokers, designers and collectors from around the world. Shelly’s philosophy has proven tried and true over the years: to build, nurture and maintain relationships with clients and suppliers by being honest and transparent in all aspects of doing business and establishing long standing relationships. Shelly understands that the sale isn’t always the pinnacle of her work but understanding what each person’s needs are will bring success, fun and a sharing of the intimate nature of the jewelry world. Fast forward to today…Shelly has the amazing job as lead curator for a world class gem and jewelry collection, Somewhere In The Rainbow. Somewhere In The Rainbow’s mission is to bring hands on education, understanding and appreciation of fine colored gems and artisan crafted jewelry to museums, retail stores and educational facilities dedicated to enjoying and appreciating the rarity, beauty and value of these gems and master artisan’s works. She has presented and exhibited in places such as The Smithsonian Natural History Museum, The Albuquerque Natural History Museum, The Tellus Museum in Georgia, multiple gemological events for gemologists and appraisers as well as been a presenter for the 100 Year Celebration of Gem-A in London, recognizing the most highly regarded gemology professionals in the world. She is a regular education specialist for JTV as well as writing a monthly blog for JTV online customers. Shelly and Somewhere In The Rainbow are members of AGTA, AGS, WJA, Gem-A of Great Britain and JSA.